Kaleb Nation's first book is quirky and suspenseful and completely fun. Bran is a funny character, and he really comes to life in Nation's clever and magical world that is well-crafted and quite intriguing. Nation's writing style is simple, yet incredibly entertaining and endlessly amusing, making it easy for younger readers to get sucked right in. 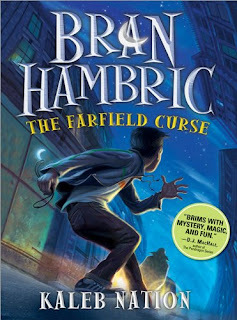 The plot is unique and fun, but also has some spookier, suspenseful elements, making Bran Hambric a well rounded read. The characters were many, so it will be interesting to see how or if Nation will develop them further in the future. Though the book does bear some striking resemblances to the Harry Potter series, younger readers will easily overlook it in favor of the comedy (one of Nation’s talents). Overall, this is a vibrant and eccentric tale that has it all: mystery, suspense, wit, and fun. Kaleb Nation is a talented new author to watch. Check out the rest of the Bran Hambric Blog Tour! I loved this book!! Once I started I couldn't put it down. The end of each chapter was it's own little cliff hanger, keeping me reading. I really hope that he hurries up with the sequel. FYI, You left me off the tour. We are the very last one's to go on the 19th.